This course will run subject to approval by the University of East Anglia (UEA). This means the course is currently going through UEA's process to confirm the course will lead to a UEA award. Course approval will take place in March 2019 and is expected to be confirmed between May and June 2019. Do you want a career in the live music industry? This degree will forge the way for anyone with a desire to join the live sound music industry, provide the necessary skills and networking for a career in this sector. All we ask is your dedication and desire to succeed. 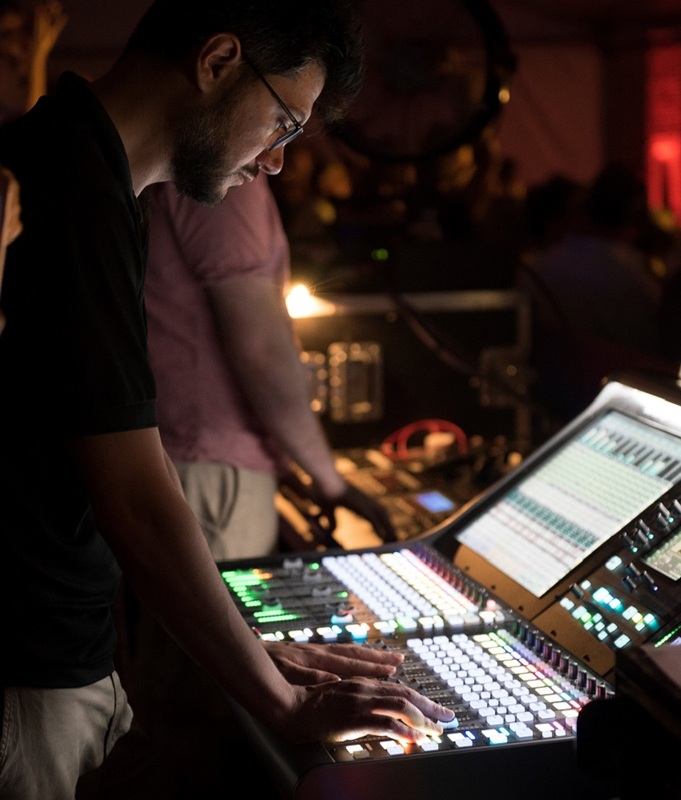 Whether Front of House engineering for a singer songwriter like Ed Sheeran or recording a full concert for the Royal Philharmonic Orchestra you will have the knowledge and skills to really stand out from the crowd in a competitive market with industry networking to open doors. Our staff work regularly in the industry and are working professionals. Don't have the credits to go to University? Don't panic! We run a Year 0 for a direct route into the course, covering everything you need to guarantee progression to the Live Sound Engineering BSc (Hons). Introducing the student to published research and the contribution that it makes to their practice and career development. Using experimentation and approaches to problem solving, suitable for the foundation of academic work. Evaluation of the research and experimental findings with a view to inform the learners' working practices. This module is a substantial task, which provides learners with the opportunity to investigate a chosen area of music that interests them (e.g.Front of House). Emphasis will be placed on the use of suitable resources and/or technologies to realise an independent creative work within a given timescale. This module introduces the principles of location recording, using portable recording devices and accessories. A range of recording scenarios will be covered, including rehearsals, live gigs and other public music events. This module introduces the fundamentals of multi-track recording and overdubbing using a range of recording devices and equipment. The scope will include traditional recording devices such as tape and hardware recorders, in addition to modern Digital Audio Workstations. Live sound engineering workflow requires collaborative skills, social interaction and communication skills. This module enhances understanding in the field whilst gaining experience of the close workflow requirements on any live sound project. Starting with signal chains and desk workflow, microphone fundamentals and recording techniques with exploration of gain structure. This module will coverthe industry recognized 'Safety Passport' awarded by the S.P.A. (Safety Pass Alliance). The physics of acoustics and how to measure and control sound. The biology of the human ear. Properties of sound, how it is propagated. Computer based systems and software used to interpret this data for better sonic results. This module will explore the intricacies of concert management, licensing, venue protocol, liability insurance, health and safety and risk assessment of all venues types. A double weighted module of 40 credits to build on working in industry opportunities. Recordings with the Royal Philharmonic Orchestra and many large band concerts will give team-working skills, engineering workflow and embed the ability to work under the pressures of live sound work in the music industry. The use and comparison of D.A.W's in the industry for live sound recording. Additional certification with AVID will be included. Learners will look more critically at the capabilities and limitations of current multiway loudspeaker systems and the software applications in the available technologies of today. The module will cover the principles of line array systems and how to use prediction software to design systems. With input from the industry specialists SMAARTV8 technology and L-Acoustics. Linking to the Music Business degree for integration across the disciplines. This module will encourage networking and transferable skills across the courses and will result in a fully managed live event. The module will aim to develop the students' ability to understand published research and the contribution that it makes to their practice and career development. It will equip the student to sustain development through the acquisition of knowledge of formal methods of enquiry, suitable for the academic and work environments whilst encouraging the different approaches to problem solving. The student will collate a portfolio of work achieved throughout the three years of the BSc, detailing work enhancement activities that they have participated in. Showing their personal development. All extra curricular recordings and Front of House engineering that the student has achieved will be collated (as part of the course) will be structured and evidenced ready for a career portfolio. They will critically analyse the portfolio to enhance the areas for employability. This module will look at modern hybrid monitor mixing, using monitor wedges, 'in ear monitors' etc. Reviewing stereo image, 3D spatialisation techniques with both music and games/eSport events. Fault solutions to optimise placement of monitoring will be explored and critically analysed. Radio transmission, frequency theory and system management with exploration of the issues related to wireless requirements. Problems such as radio interference and how to troubleshoot with active monitoring with other systems will be tested in working groups to permit a full understanding of the issues that are regularly encountered in live recording and monitoring scenarios. Live event attendance to permit experimentation is included. This module will focus on the development of crucial presentation and networking skills ready for exit from an undergraduate programme into employment within the live music and events industry. The importance of effective planning, communication, research and listening, will be core to the module. Attendance at actual business and creative industry events will be required to achieve the module outcomes. A year-long exploration and research module. The dissertation can be chosen by the student in a field of live music they would like to explore in greater detail. Research and exploration of both primary and secondary sources with interaction from the industry is expected. Two options of a 10, 000 word or 7,500 word with practical portfolio dissertation project are available. The course is assessed using real events as production portfolios, written assignments and presentations. Graduates from this course will be equipped with a wide range of transferable skills which will enhance their employment prospects both within the music production sector (recording, mixing, producing), live sound field for all genres of music, project management, song writing, composing, arranging and orchestration for commercial music, game music and cinematic scoring.